Antique Mahal Rugs and Carpets – It has occurred to me that we never addressed the issue of Persian Antique Mahal Rugs vs. Sultanabad Rugs. There is a growing misconception that Sultanabad Rugs & Mahal Rugs were both woven in the same place – Arak. But in reality, Sultanabad rugs were woven in Arak while Mahal carpets were woven in the city of Mahallat which is also known as Mahallat-e Bala or Mahallat Bala, which, according to the 2006 census, has a population of 35,319, & 10,285 families. While Mahallat is located 146 killomiters to the west of Arak, both cities produced very similar rugs in look and texture. This is why, in today’s antique oriental rug world, the terms are almost interchangeable. Both weaving centers are famous for producing rugs that have larger scale patters and are casual in feel than those that were woven in other major cities and weaving centers. There are some differences in look and feel, it is mostly the weave and texture that set them apart. Mahal rugs tend to have a courser weave, the wool is not as lustrous and the design is not as refined as those that were produced in Arak ( Sultanabad ). Price is also a factor, since the carpets from Sultanabad are considered better quality and are feature designs that are more interesting they were always more expensive than their Mahal counterparts. Both rug productions incorporate patterns that are not exactly floral or geometric, a unique feature which makes them extremely versatile and can be incorporated in almost any setting or decor. 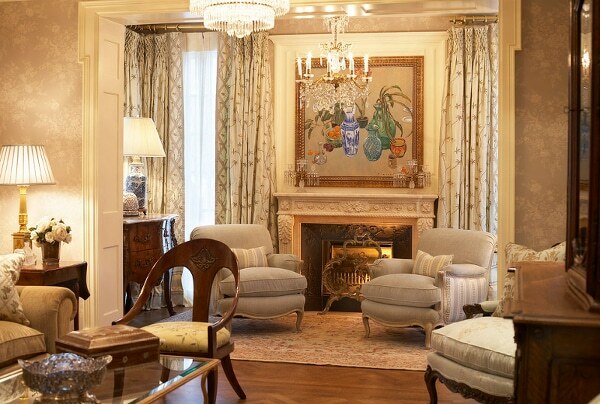 The Ziegler firm produced rugs for the European markets in both locations. Therefore the term Ziegler Mahal or Ziegler Sultanabad refers to the rugs produced in their respected cities. For the most part, it is very difficult to tell them apart (unless you are in the trade) which is why most dealers simply pick one name or the other to categorize the rugs in their collection. In addition, some dealers might even simply use the term Sultanabd to refer to the better and older pieces that were produced in either location. So if you are shopping for antique rugs and find out that you like Sultanabad rugs or Persian Antique Mahal carpets, I would strongly urge you to look at the other as well – you might be surprised to find that you have more of a selection than you thought. When decorating with antique rugs from Sultanabad, it is useful to know a little bit about the background of these rugs. Indeed, antique Mahal carpets offer one of the most interesting histories of any antique rug style. Similar to Amritsar rugs and carpets from India, Persian Mahal rugs were originally conceived and manufactured to specifically appeal to the taste of Western consumers. The large scale, all over design, and use of western color palettes are all characteristics of antique Mahal rugs. Designers in Sultanabad experimented with traditional color palettes and reinvented ancient Persian designs to better suit Western tastes. The best antique Mahal carpets feature floral patterns, beautiful arabesques and stark medallions woven in strong jewel tones. However, there is a good deal of variety among Mahal rugs, giving the designer some flexibility when working with such pieces. The Persian Mahal rug featured in the photo above, in a gorgeous room designed by Lori Morris Interiors, is a wonderful example of those Persian Mahal carpets that feature a softer, earthier palette. This room also showcases just how impeccably a beautifully woven Persian antique Mahal carpet can tie together a space, most especially when that space features attractive furnishings that play off of the rug’s superior qualities. Decorating with a beautiful antique Mahal rug is an experience that is as unique and varied as these magnificent carpets themselves. For fine interior designers and art enthusiasts, there is nothing comparable to the rarity and beauty of a Mahal Persian carpet from the nineteenth and early twentieth centuries. These rugs are regarded as some of the best examples of folk art weaving, and they are prized for their sophisticated yet whimsical aesthetic. The name is derived from the Mahallat village where the rugs were crafted, and they are characterized by beautifully intricate designs and a coarser knotting style. The Mahal carpets in this time period were most often made by an entire family, which explains the loose-to-moderate weaving. They also tend to have a thicker pile like the rural and tribal rugs of the time. In spite of the seemingly less refined production methods compared to the more finely knotted styles such as Mahajiran and Farahan Sarouk , Mahal carpets are viewed as “equals” in terms of beauty and aesthetic. The most coveted antique Mahal rugs are woven with unique variations on popular Persian carpet patterns. These rugs can be found in the Herati style, which is the “diamond and curling leaf” pattern, or the Harshang, which features a stylized dragon and flower blossom motif. They may also showcase the Mina Khani, known as a “repeated flower head” design, or an interesting blend of all three motifs. Typically, Persian Mahal rugs will have these patterns woven into the entirety of the rug in rich earth tones and muted colors. However, some utilize what is called the central medallion format, which is frequently found in other styles of Persian rugs. The rarest and most prized of the Mahal carpets is a class known as “Ivory Mahals.” The defining feature of these uncommon beauties is that the entire tapestry is woven with varying shades of beige, cream and ivory. To complement the soft palette, the designs on these rugs are often of a more delicate and whimsical nature. It is common to see delicate latticework and gossamer vines and flowers depicted in exquisitely soft pastel shades. In fact, the most highly sought after designs for all Mahal rugs are those that incorporate dramatically oversized blooms in an asymmetrical pattern. To add even more depth and artistic drama, these carpets typically feature a style with delicate striations of color known as “abrash,” which adds shading and highlight to the creamy hues. Near the turn of the century, a new style of Mahal rugs was created. These are what are now commonly known as Ziegler Sultanabad carpets, or simply “Zieglers.” The name comes from the venture capitalist firm Ziegler & Co. of Manchester, England. This company paid for unique Persian carpets that were specifically commissioned for resale in English and French markets. Because these were made with the express intent of selling to wealthy French and English buyers, Ziegler carpets quickly took on a style of their own. They are characterized by a very fine weave, thinner fabric and designs that were considered the height of style at the time. Westerners became immediately infatuated with these rugs, and despite the fact that the patterns were distinctly Persian in inspiration, Zieglers are notable for their obvious English influence. While all of these rugs were created in the Arak region, the distinct styles appeal to many different tastes and aesthetics. Traditional “village” Mahals are preferred by many collectors for their folksy, charming creativity and more casual knotting style. Ivory Mahals are prized for their unique artistry and delicate beauty, and Zieglers are beloved for their exemplary craftsmanship and visually interesting motifs. Without exception, Mahal antique carpets are treasured for their unparalleled artistry. Fine art lovers and luxury interior designers hold these rugs in high regard not only for their beauty but also for their versatility and compatibility with any interior space. Because of their status, these antique carpets are a gorgeous investment that will only appreciate in value as time passes.